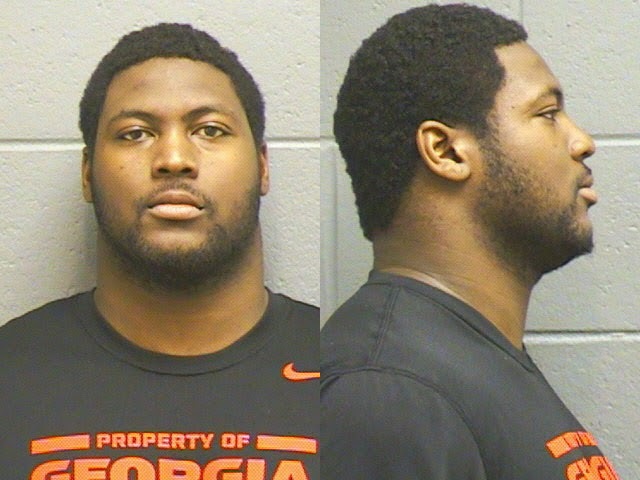 Jonathan Taylor's mugshot from March arrest. Details are limited at this time, though it was presumably an on-campus incident due to the involvement of the UGA police. UPDATED 9:00 AM: The Athens Banner-Herald's Mark Weiszer is reporting that Taylor's arrest is the result of an alleged domestic violence incident incident on the UGA campus. "Police determined that Taylor was the "primary aggressor" in a domestic violence inicdent at McWhorter Hall, according to University of Georgia police chief Jimmy Williamson. UGA police and EMS were dispatched at 2:47 a.m. to meet a possible victim at Busbee Hall. The call came from a third party. Police met with the victim and third party at Busbee. There was evidence that the female victim had been "possibly strangled by the offender," in the incident in Taylor's dorm room, Williamson said. There was evidence that the victim and another individual had been involved in an argument in McWhorter Hall, police said. Officers determined an established relationship and "co-habitation" with the individuals." Weiszer describes the victim as being a UGA student who is not "enrolled in summer school." This is the second arrest for Taylor this year. He was one of four then-Bulldog players arrested in March on charges of "theft by deception" after they deposited stipend checks from the school electronically, then turning around and cashing them. He was placed in a pre-trial intervention program in June. Taylor is likely to be automatically suspended for his arrest as per University of Georgia athletic association policy. It is also likely this second arrest will result in Taylor becoming an ex-Georgia DL.